Phil Andrews is now known as the virtually invulnerable County Council Member from District 3 (Rockville/Gaithersburg), but he did not start out that way. Andrews first ran for a council at-large seat in 1994. 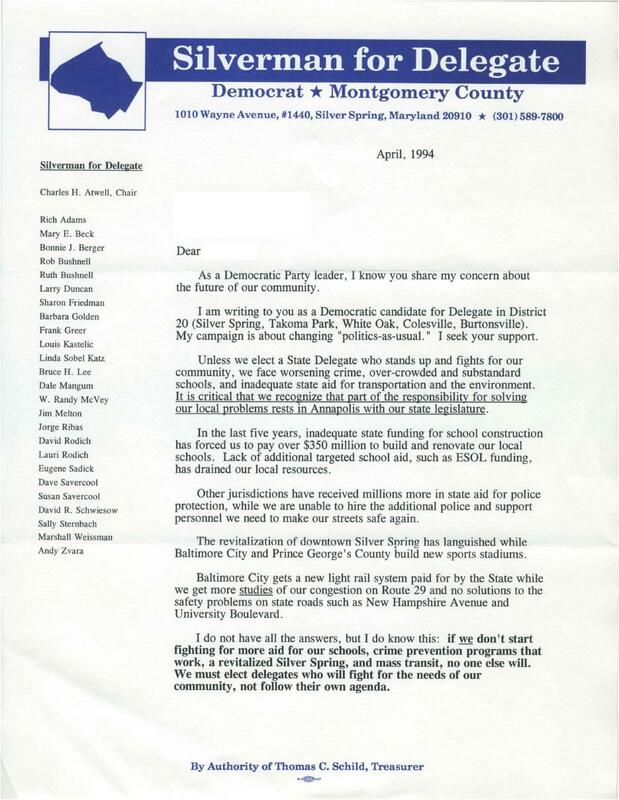 Here is his kickoff letter to Democratic Party activists, citing his experience with Common Cause and his vow not to take PAC or developer money - a promise he has kept to this day. Andrews would not win this particular election, but it set him up nicely to win his district seat four years later. 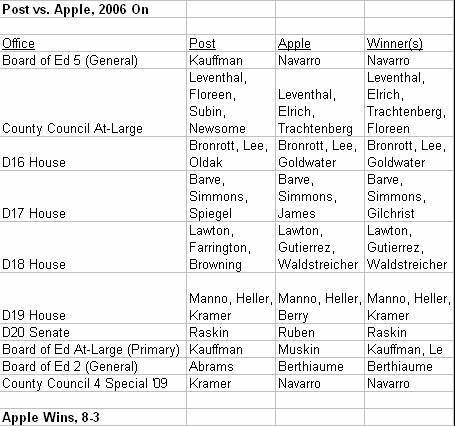 Five top-tier candidates ran in the 2006 Council At-Large primary: incumbents George Leventhal, Nancy Floreen and Mike Subin and labor-backed challengers Marc Elrich and Duchy Trachtenberg. A host of less competitive candidates also ran, including four who were black and one who was Asian. Did the demographic characteristics of the county’s precincts have any effect on these candidates’ votes? Following are the vote totals of the five major at-large candidates by demographic category of precinct. 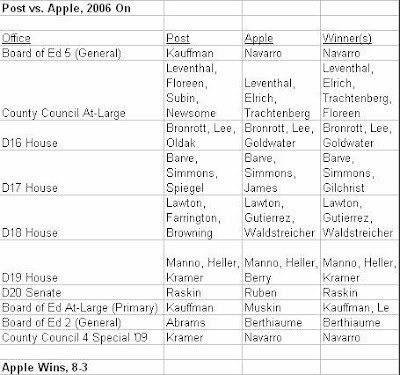 Overall, the rank order of finish in the 2006 Democratic at-large primary was George Leventhal, Marc Elrich, Duchy Trachtenberg, Nancy Floreen and Mike Subin, in that order. Those ranks did not change very much in different kinds of precincts. Leventhal had a great year and finished first in most places. Marc Elrich was a Takoma Park City Council Member and had run twice before in majority-minority District 5, so he did very well in heavily black precincts in those areas. Duchy Trachtenberg ran well in Bethesda since she had run for council there four years before. Her performance in white precincts was driven by her strength in Bethesda. Mike Subin ran fifth nearly everywhere. In none of these categories did a candidate of color break into the top four, though in precincts where blacks were 33% or more of the population, Hugh Bailey (who is African American) did edge out Subin for fifth. The bottom line in our analysis is that we do not detect major race- or ethnic-based voting patterns in the 2006 at-large primary. Perhaps that was more of a factor in the 2008 and 2009 Council District 4 special elections, when Nancy Navarro was on the ballot. Perhaps things will work out differently in 2010. And since we are now putting the finishing touches on the 2010 data, we will find out soon enough. During the entire 1998-2002 term, freshman Council Member Blair Ewing battled County Executive Doug Duncan on the ICC, development policy, living wage and other issues. In the spring of 2002, intense speculation centered on whether Ewing would challenge Duncan in the primary. Ewing instead formed a slate of challengers to take over the council, prompting Duncan to form his own slate: the End Gridlock Team. Duncan's team massively outspent Ewing and swept all the at-large seats. End Gridlock did many negative mailers, some of which we will be reprinting, but below is one of the positive ones. Ariana Kelly, who won the Democratic primary for the District 16 House seat, has now joined the incumbent slate of Senator Brian Frosh and Delegates Susan Lee and Bill Frick. The four will campaign together against the Republican candidates in the general election. Following is an email sent by Kelly to her supporters yesterday. Ariana Kelly has joined the District 16 Democratic Slate, marking the end of a close primary election season in which she defeated 10 other candidates to secure the third nomination on the Democratic ticket. Ariana Kelly will be joining the Democratic slate with District 16’s incumbent Democratic team: Senator Brian Frosh, Delegate Susan C. Lee and Delegate Bill Frick. Senator Brian Frosh said, "We are pleased to welcome Ariana to the slate. We know that her policy experience and concern for Maryland's families will make her an outstanding delegate in Annapolis." Kelly will join Delegates Frick and Lee in facing Republicans Jeanne Allen, Carol Bowis, and Meyer Marks in the November 2 General Election. Democrats in Maryland’s District 16 enjoy a nearly three-to-one voter registration advantage over Republicans. Frosh, Frick, Kelly and Lee have opened a joint campaign office in Downtown Bethesda from which they will be running their general election campaign and supporting Governor O'Malley and the rest of the Maryland Democratic team. Ariana Kelly is a nonprofit executive who has worked for more than a dozen years on issues important to Montgomery County, including public health, education, small business issues and the environment. Kelly was born and raised in Maryland's District 16. She and her husband Barak live in Bethesda with their two children. Conventional wisdom holds that voters of color do not turn out at the same rate as white voters. How true is that in Montgomery County? As we detailed in Part One, we have collected precinct-level data on population percentages of Hispanic, white non-Hispanic, black non-Hispanic and Asian non-Hispanic residents and merged it with precinct-level turnout and voting data. This does not allow us to see the turnout percentages for each group, or the voting behavior of each group. But it does allow us to see whether precincts that are dominated by each group tend to behave differently from other precincts. Following are the turnout rates by different demographic category of precinct in the 2006 primary. These rates include all voters, not just Democrats. The countywide turnout rate was 24.0%. In precincts with white population shares of more than 90%, that turnout climbed north of 29%. In precincts with Hispanic and Asian population shares of more than 33%, turnout dipped to below 20%. In precincts with black shares of more than 33%, turnout was 23.1% - not that different from the countywide average. That may be because African Americans are concentrated in District 20, and that district saw a barnburner of a Senate race (Ida Ruben vs. Jamie Raskin) in 2006. The turnout rates differ by precinct demographic, but not that much. Compare these differences to turnout rates by raw geography. There is actually more variation on geography than there is on demographics. Several Upcounty areas had turnout rates in the mid-teens, while Takoma Park topped 32%. Now perhaps the Upcounty areas had more Republicans and unaffiliated voters, who have fewer voting options in a primary, and that explains their lag. But at least in the 2006 primary, geography was as good – and maybe even better – a predictor of turnout than race or Hispanic status. So did demographically diverse precincts vote differently from white precincts? We’ll look at the 2006 at-large primary to answer that question tomorrow. 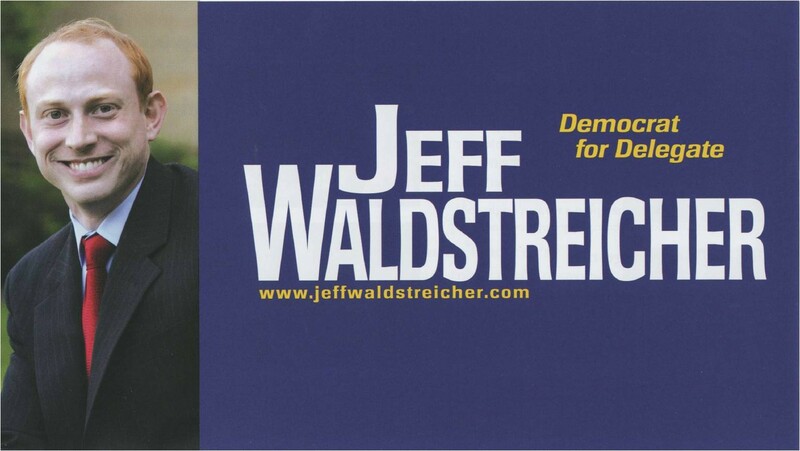 This is the walk piece used by District 18 Delegate Jeff Waldstreicher in his first run for office in 2006. Jeff won a close race over fellow first-time contender Dan Farrington for the third Delegate seat and finished second in the primary this year. The Board of Elections has released its official primary results that show Karen Montgomery defeating District 14 Senator Rona Kramer by a 4,973 to 4,857 vote tally. 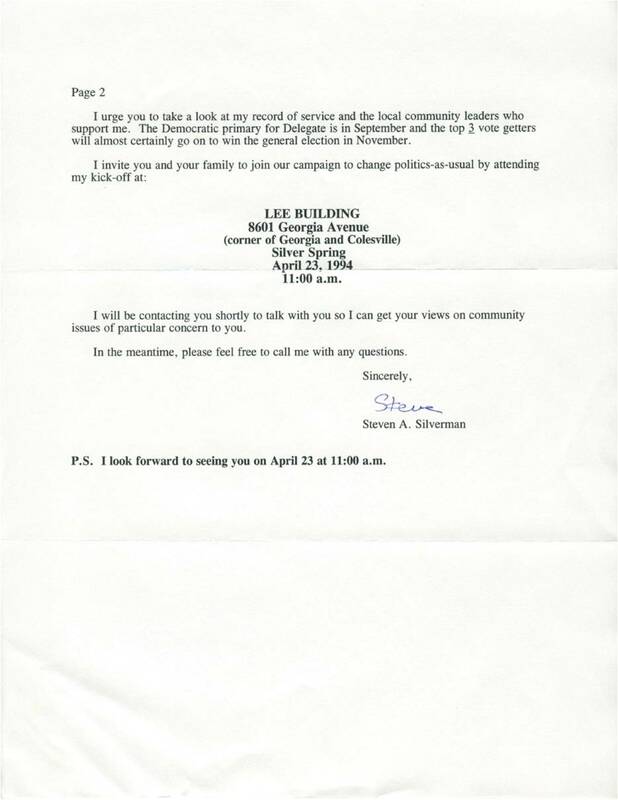 Montgomery sent the following email to her supporters claiming victory. To all the wonderful people who have helped in my campaign for Senate in District 14: THANK YOU!!!! I am overwhelmed by your kindness, capability, willingness to volunteer your work, skills and time, and most of all, your faith in me to work as hard as I possibly can for our community and state. As we saw in Part One, MoCo’s major demographic groups are not distributed evenly across the county. Here are the percentages of Hispanics, white non-Hispanics, black non-Hispanics and Asian non-Hispanics in every Congressional, legislative and council district as well as each locality in the county. Two years ago, we demonstrated that Montgomery County was the most diverse jurisdiction in Maryland. But the county is essentially a group of smaller subdivisions, some integrated and some not. State Legislative District 20, Council District 5 and Takoma Park, East County, Downtown Silver Spring, Wheaton, Burtonsville and the City of Gaithersburg were all “majority-minority” areas in 2000. It’s reasonable to assume that since then, State Legislative Districts 17, 19, 39 and perhaps 18, Council Districts 3 and 4 and North Potomac and Germantown may have also become majority-minority. On the other hand, State Legislative District 16, Council District 1, and Bethesda, Chevy Chase, the Town of Kensington, Damascus and several other rural Upcounty areas are very heavily white. So does any of this affect actual voting behavior? We’ll start investigating that in Part Three. Over the last two years, a number of adjectives have been used to describe the county’s ongoing budget crisis. “Unprecedented.” “Abysmal.” “Devastating.” “Unthinkable.” Well, maybe those adjectives were suitable as the county’s Great Recession got underway, but now they’re obsolete. Budget disaster here is the New Normal. In the spring of 2008, the big budget battle was whether county employees would be asked to give up two points from their cost of living adjustments. (They would get to keep the remaining two to three points.) In the end, the County Council broke the charter limit and the employees kept their raises. But by the end of 2008, things had gotten so bad that the school employees voluntarily gave up their raises and the other unions followed. In late 2009, most of the employees’ collective bargaining agreements came up for renegotiation. Raises were off the table. By the spring of 2010, the terms of debate had shifted to whether all employees would be subject to furloughs of equivalent impact. Now layoffs are openly discussed. That’s quite a long ways to come in just two years, folks! This is the New Normal. And part of why it is the New Normal is that the county’s way of dealing with its problems often involves temporary measures. The FY 2011 budget includes both furloughs as well as a sunset energy tax. If both of those measures prove insufficient, they will likely be renewed and other temporary fixes will be installed. But that approach almost guarantees that planned expenditures will exceed estimated revenues in each year. And then the council will have to weigh the needs of warring constituencies, the unions, the predictably negative editorials of certain newspapers and, of course, the bond rating houses. It’s a recipe for gray hair, excess eating and lots and lots of Prozac. Consider some of the points made by a recent budget memo sent to the council from its Staff Director and from the Executive Branch’s budget officials. 1. On a year-to-year basis, Montgomery County’s jobs base is still down. Its unemployment rate is bouncing around between 5% and 6% with no clear trend down. Both of these factors will affect income tax collections. 2. In 2009, the inflation rate was just 0.23%. That’s important because the charter limit on property taxes is tied to inflation. When inflation is low, the county has little ability to raise the amount it collects in property taxes, its greatest single source of revenue. The 2008 Ficker Amendment mandates that all nine Council Members must vote in favor of overriding the charter limit and raising property tax revenues above the rate of inflation. We expect that the next council will not be able to muster nine votes for such an increases. The low charter limit puts even more pressure on spending. 3. Existing home sales, home prices and new construction are all below the levels of 2000-2005. This will hold back property assessments, recordation taxes and transfer taxes – all major sources of county revenue. Again, that puts more pressure on spending. 4. The county’s Office of Management and Budget (OMB) is recommending that all departments will have to cut their budgets for next year by 10-15%. That comes on top of this year’s cuts, in which several agencies took double-digit reductions. Additionally, three long-term factors loom large over the budget. First, the General Assembly is poised to shift a portion of teacher pension liabilities to the county. The plan that passed the Senate in the last session would have cost Montgomery County $69 million or more annually by FY 2014. No one can say how we will pay that money. Second, the county still has to deal with the state’s Maintenance of Effort law mandating that it at least maintain per-pupil local spending on education each year. The county received a waiver from that requirement last spring (and got a fine overturned by the General Assembly), but all bets are off for 2011. In bad budget times, this law’s effect is to concentrate cuts away from schools and towards other county functions, like public safety. There is clearly a limit to the county’s ability to do that. Third, the best thing the County Council did on the budget this year was to pass a package of fiscal process reforms recommended by the County Executive. The goal of these reforms is to put the budget on a path towards sustainability as well as to protect the county’s AAA bond rating. One of their key components is to steadily build up the county’s reserve level from 6% of revenues to 10% over the next ten years, both to protect the bond rating as well as to prevent mid-year emergency cuts in bad times. If the council is to make progress on that goal, it will have to put aside more money for reserves just as it is cutting spending. That will be extraordinarily difficult, but necessary. Because if the county does not stick to a long-term plan for restoring some sense of order to its budget, the New Normal will be “normal” for a long, LONG time. Like many of you, we are eagerly entering the precinct-level counts from the recent primary. (OK, we know that not all of you are on the edges of your seats about that – just the really nerdy ones. But we love all of you data dorks on MPW!) While we work on that task, we offer our readers a new layer of electoral analysis. In our prior work, especially on the Council At-Large race, we focused on precinct-level geography in assessing the strengths and weaknesses of candidates. Now we are ready to integrate something new: demographics. As part of the ten-year Census, the U.S. Census Bureau collects data on race and Hispanic status on a variety of geographic levels, including all the way down to election precincts. State and local governments as well as courts are supposed to consider that data as part of redistricting. We have collected and crunched distributions of Hispanic, white non-Hispanic, black non-Hispanic and Asian non-Hispanic and merged it with Democratic primary results at the precinct level for 2006. That allows us to determine turnout and voting patterns for different demographic categories of precincts. There are some limitations with this technique. First of all, if we can show that eight precincts with a concentration of a particular demographic group voted heavily in favor of Candidate X, we cannot necessarily conclude that that particular group was directly responsible for that outcome. Such an analysis may suggest that, but it does not necessarily prove that. Second, the demographic data is ten years old. We used data for all residents as opposed to voting residents because we believe the teenagers of 2000 may well be the voters of 2010. But that does not truly fix the time lags associated with using ten-year-old data. Our hunch is that non-white population shares have increased all over the county, but we will not be able to see that at the precinct level for 2010 for another couple years. Third, a few of the precinct definitions have changed since 2000. Some have merged and others have split up. We have tried to compensate for that by redistributing demographic results across split districts. So, for example, if Precinct A is 40% white, and is then split up into Precincts B and C, we assume that both B and C are 40% white. That is FAR from perfect, but if A, B and C remain in the same council district, legislative district, zip code and locality, it won’t matter very much. Finally, there are sample errors associated with the Census data. Even with high citizen response rates, the Census Bureau cannot collect demographic data on every single human being in every precinct. The above caveats shows that our analysis is not perfect, but it’s the best we can do. Let’s start by acknowledging that the county’s demographic groups are not distributed evenly across its land area. Here is the percentage of residents who were white in 2000 by census tract. Here is the percentage of residents who were African American in 2000 by census tract. Here is the percentage of residents who were Asian in 2000 by census tract. And here is the percentage of residents who were Hispanics in 2000 by census tract. 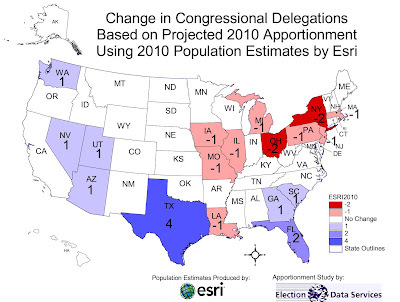 Keep these maps in mind as we start looking at demographics and geography in Part Two. Election Data Services projects that Maryland will neither gain nor lose a seat in congressional reapportionment this year. Based on ESRI's unofficial estimates--not the official census numbers that have yet to be released--Maryland's eighth district will be the 409th to be awarded while the U.S. House would need to have 462 seats for us to gain a ninth district. As the map shows, most of the losers are in the region of the country formerly known as the Rust Belt. However, MPW has decided to rename this group as Climate Challenged in honor of the addition of Louisiana. The other states are traditionally labeled the Sun Belt but that somehow doesn't seem right with the inclusion of rainy Seattle. 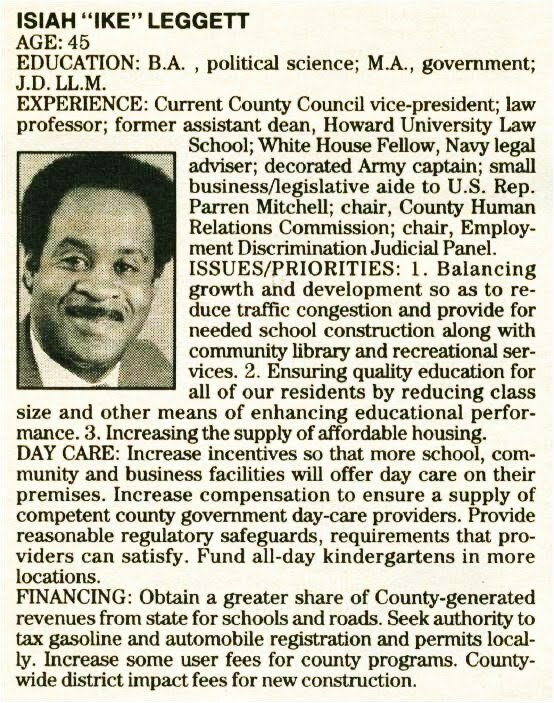 In 1990, then-freshman Council Member Ike Leggett was running for reelection. Here is what Leggett had to say in the Montgomery Journal about his goals for his second term. MPW Reader Poll: Can Robin Ficker Beat Craig Rice? Robin Ficker's ballot initiative to pass term limits for county office holders may not get through the courts this year, but this is not the first time Ficker has tried to pass them and it probably won't be the last. 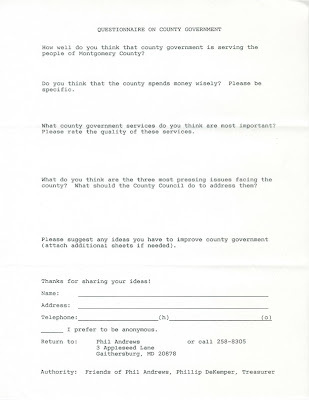 In 2000, Ficker put Question C on the ballot, which would have limited county elected officials to two terms. Almost the entire political establishment joined forces to defeat it and the initiative failed on a 54-46% vote. We reprint one of the opponents' flyers against it below. Kudos to Dan Savage for beginning this amazing and brave online video series profiled in the New York Times called the It Gets Better Project. Dan was inspired to start this after hearing about Billy Lucas, an Indiana gay teen targeted by bullies who committed suicide. Here is Dan and Terry's video. If we made a list of the heaviest hitters in MoCo politics who have never been elected to federal, state or county office, it would have to include Pat Baptiste. Baptiste is a former Planning Board Member and municipal board member of Chevy Chase Village who has been active in county affairs for decades. She made two runs for County Council: once for an at-large seat in 1998, and once for the District 1 seat in a 2000 special election. She lost the 1998 race to Steve Silverman by just 640 votes. (County history would have been very different had that election gone the other way.) We reprint Baptiste's 1998 walk piece below. Comptroller Peter Franchot has issued the following statement in response to the Examiner story quoting him as expressing skepticism about the Purple Line. “In the past three and half years I have never felt the need to respond to an article or column written about me, or positions that I have taken on public policy issues. However, today’s Washington Examiner story is such a gross misrepresentation of my longtime position on Maryland’s Purple Line project that I feel compelled to set the record straight. Over my career in public life, I have been a strong and consistent advocate for creating accessible mass transit options across the state, none more so than the Purple Line. I publicly advocated on behalf of this project as a member of the Maryland House of Delegates from the 20th District, which includes several communities that will be directly served by this vital rail line, and successfully fought to protect project funding as Chairman of the House Subcommittee on Transportation and the Environment. I believe today, as I always have, that the Purple Line will substantially improve transportation mobility in one of the nation’s most congested regions. I believe that the Purple Line will provide reliable and convenient service to communities that are in urgent need of better transit options, and I believe that it will be a catalyst for environmentally sustainable, transit-oriented development that will ultimately enhance our State’s economy and quality of life. It is in that spirit that I restated my longstanding support for the project at yesterday’s Board of Public Works meeting, and expressed appreciation to Governor O’Malley for his support of the project, as well as the proposed Red Line that will serve the Baltimore region, and the Corridor Cities Transitway in the Washington region. As Comptroller, I take my role as an advocate for the taxpayers very seriously. When items come up for approval before the Board of Public Works, I carefully review them and often ask the presenting agencies questions to ensure that we are managing taxpayer dollars as efficiently as possible. At Wednesday’s meeting, I did ask substantive questions about two general engineering consultant contracts with eight-year terms and a total cost of $160 million. Given the magnitude of this investment of taxpayer dollars, particularly at a time when so many other worthy projects around the State have been deferred due to budget constraints, I sought reassurance from Maryland Department of Transportation (MDOT) officials that these services “are absolutely vital to the goal of getting these projects funded and built” and that the State of Maryland would truly be getting $160 million worth of work from these consultants. Transit advocates must be dismayed at Comptroller Peter Franchot’s comments casting doubt on the viability of the Purple Line, especially since many considered him a project supporter. But is that perception really true? Consider his statements on the project. Franchot criticizes a proposal by Delegate John Hurson (D-18) to build the Purple Line as a busway on Jones Bridge Road. Franchot accuses Hurson of getting the Ehrlich administration to adopt his position on the Purple Line in return for Hurson flipping his position on slots to match Ehrlich’s stance. Del. Peter V.R. Franchot (D-Dist. 20) of Takoma Park has criticized Hurson's stands on the two issues, and the appearance of a connection between them. "This is a double whammy," Franchot said, "because the Purple Line is a high priority to relieve congestion and help the environment, and slots should be a low priority because it is a hidden tax on the poor, breeds addiction and wreaks havoc on small business. Del. Hurson has managed to combine the two issues." Franchot goes after the Columbia Country Club for opposing light rail on the Purple Line. Several lawmakers, including Del. Peter V.R. Franchot (D-Dist. 20) of Takoma Park, blamed the club's political influence with Gov. Robert L. Ehrlich Jr. (R) for derailing the Purple Line earlier this year. The Georgetown Branch Trail bisects the country club, and Franchot said club members did not want a light-rail line coming through the golf course. "What are we sacrificing the public interest for?" Franchot asked. "A number of gentlemen who, with green pants and pink shirts, want to hit a little white ball on Sunday afternoon?" As chairman of the Transportation and Environment Subcommittee of Appropriations in the House of Delegates, I have fought hard for transit projects that will ease our abilities to get around as well as reduce our dependencies on cars. I will continue to fight to free up funding to projects like the Inner Purple Line and Inner Purple line in the DC metropolitan area as well as the Red line in Baltimore. Franchot attacks the Purple Line’s costs, specifically targeting two engineering contracts. Maryland Comptroller Peter Franchot blasted the planned Purple Line on Wednesday, questioning its cost and its ability to win federal funding. 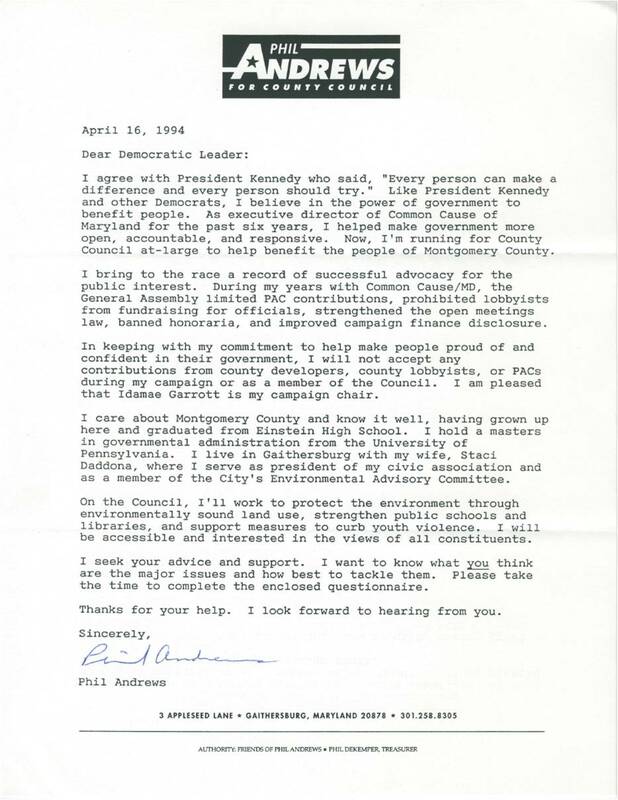 His criticism aligns the Montgomery County Democrat with former Republican Gov. Bob Ehrlich against Democratic Gov. Martin O'Malley's billion-dollar pet transportation project. Franchot criticized the costs associated with the 16-mile light rail line that would connect New Carrollton and Bethesda and an expansion of Baltimore's subway system -- projects that aren't due for construction until 2016. He targeted planned contracts with two Baltimore engineering consultants estimated to cost $160 million over eight years. "It just strikes me that an eight-year, $160 million commitment is an awful lot of money for an awful long time for, frankly, projects that are still -- speculative is probably too harsh a word, but the question of whether they are going to get funded is still up in the air," Franchot said during a Board of Public Works meeting on Wednesday. So Peter Franchot favored the Inner Purple Line project, an early term used to describe the Bethesda-Silver Spring route. But then he praised Governor Ehrlich’s bus rapid transit alternative. And then he slammed Delegate John Hurson’s bus rapid transit alternative. 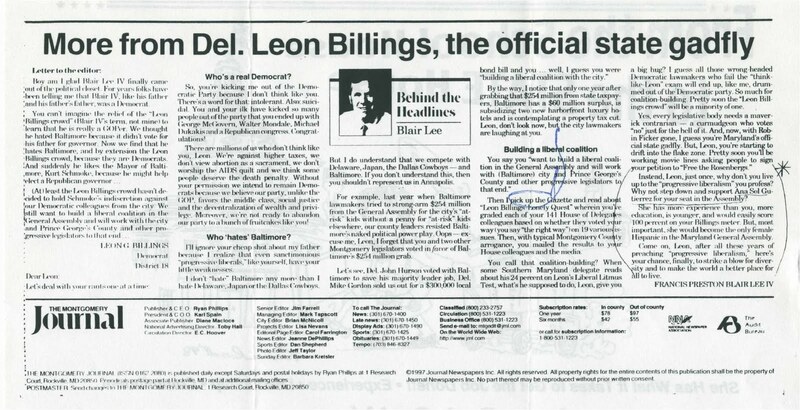 He later went on the record multiple times in favor of rail on the Bethesda-Silver Spring route, but criticized the relevant engineering contracts – before voting in favor of them. So has Franchot changed his position on the Purple Line? We can’t say, because looking at his record, we’re not sure what it is. Franchot for MDOT Secretary, anyone? Senator Nancy King (D-39) has sent the following statement to her supporters thanking them and reaching out to her primary opponent, Delegate Saqib Ali. The dust has settled, the votes are in and we made it across the finish line. We could not have done it without you! From the bottom of my heart, I thank you. After running a rigorous campaign over the past several months, I am truly honored to be the Democratic nominee for State Senate in the 39th District. I can't begin to express my gratitude for all you've done to make our victory possible. Whether you knocked on doors, made phone calls, put up yard signs, or talked about the campaign with your neighbors and friends, every effort counted and we couldn't have done it without you. I want to offer my best wishes to Delegate Saqib Ali. I admire Saqib's energy and enthusiasm and his passion for engaging people from all walks of life in the democratic process. I appreciate Saqib's support in the November general election and I hope he will continue to play an active role in our community. I also want to extend congratulatory wishes to my teammates, Delegate Charles Barkley and Delegate Kirill Reznik, who also won the primary election. Additionally, I want to welcome Shane Robinson, the third Democratic nominee for the Maryland House of Delegates, to the District 39 Democratic Team. We look forward to working together to turn out voters in District 39 to secure a victory for the entire Democratic team. Our team would greatly appreciate your support over the next 41 days leading up to Election Day and we hope that we can count on your vote on November 2nd. Again, thank you for your hard work and support during the primary election. I truly appreciate the chance to again serve the citizens of District 39 as your State Senator. Here's a joint independent mailer sent by MCEA and the Sierra Club on behalf of District 19 Delegate candidates Bonnie Cullison and Jay Hutchins this past summer. Both candidates were endorsed by both groups, making the collaboration possible. Council District 2 Democratic primary winner Craig Rice has sent a thank you message to his supporters that pays respect to his Democratic opponents. But Rice also has a warning: don't get complacent because Robin Ficker is his general election opponent. Following is Rice's email. First, let me say thank you. It is because of the support of you and my fantastic campaign team that exactly one week ago at this time, we received the final election numbers confirming I had prevailed in my election. I would also like to thank Sharon Dooley, Royce Hanson, Charles Kirchman and Eddie Kuhlman for taking part in seeking the Democratic nomination. It is a tremendous sacrifice to run for office and they should be applauded for their quest and running spirited campaigns. And special thanks go out to Eddie Kuhlman, who has offered his support to ensure a victory in the general election. But our work is not over. I face a formidable opponent whom we all know or have heard of...Robin Ficker. I am sure he will try everything from distorting the truth, to rumor and conjecture, to defeat me. I will need your help to ensure, now that I am the Democratic nominee, we prevail in November. You can help right away by contributing to the campaign. Any amount will help to get our message out early and often. Please log onto my website www.craigrice.org and click on the donate page. In addition, I would love to have you walk with me as I continue to crisscross District 2, continuing to talk to voters and identify ways that the council can make Montgomery County the best place to live and work. If you would be able to volunteer for door knocking or phone banking, please contact Sharon St. Pierre at Stpierre619@verizon.net or 240-938-1309. Also, please let me know if you would like a "Craig Rice for County Council" yard sign. We will deliver it right to your door. Just let us know you'd like one at my website: www.craigrice.org. Again, I can't thank you enough for your support, your vote and your prayers. And please don't forget I will need you again in the general election in November. I hope to see you on the campaign trail. Here's an odd one. 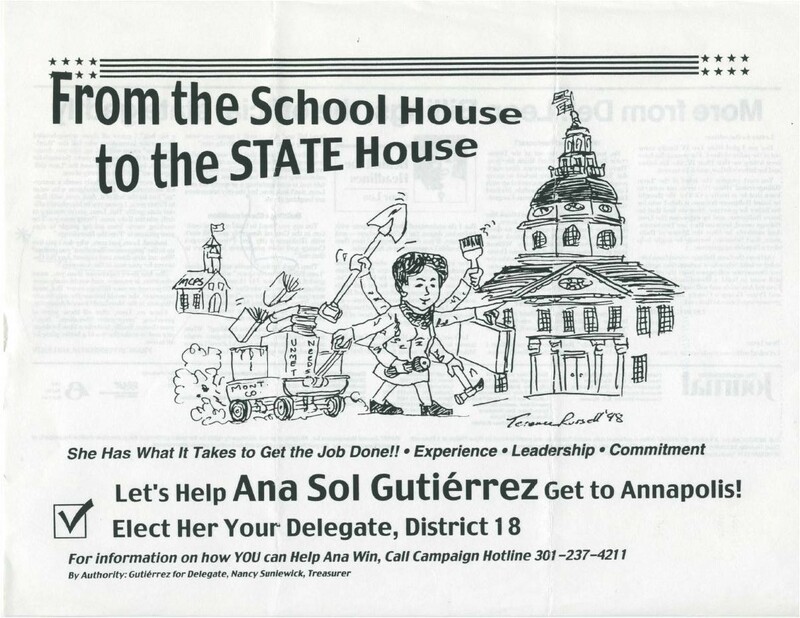 School Board member Ana Sol Gutierrez first ran for Delegate in 1998 against a slate of incumbents. She lost that race, but was elected in 2002 and finished first in this year's primary. In her 1998 run, Gutierrez distributed the flyer below promoting her candidacy. 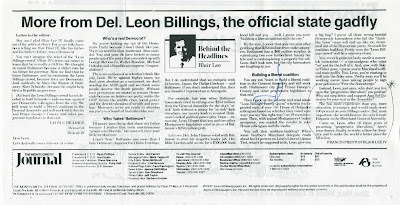 The reverse side of the flyer reprints a column by none other than Blair Lee, who got into a spat with incumbent Leon Billings and actually urged him to drop out in favor of Gutierrez. It's not often that Ana and Blair are on the same side of an argument, so this is one for the ages. Steve Silverman is best known for his two terms on the County Council and his run for County Executive in 2006. 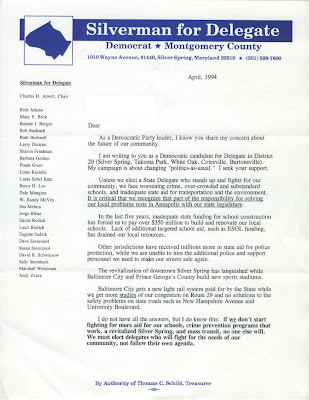 But few people remember that Silverman ran for Delegate in District 20 back in 1994. All three incumbents – Sheila Hixson (who first entered office in 1976) and two-termers Peter Franchot and Dana Dembrow – were running for reelection. 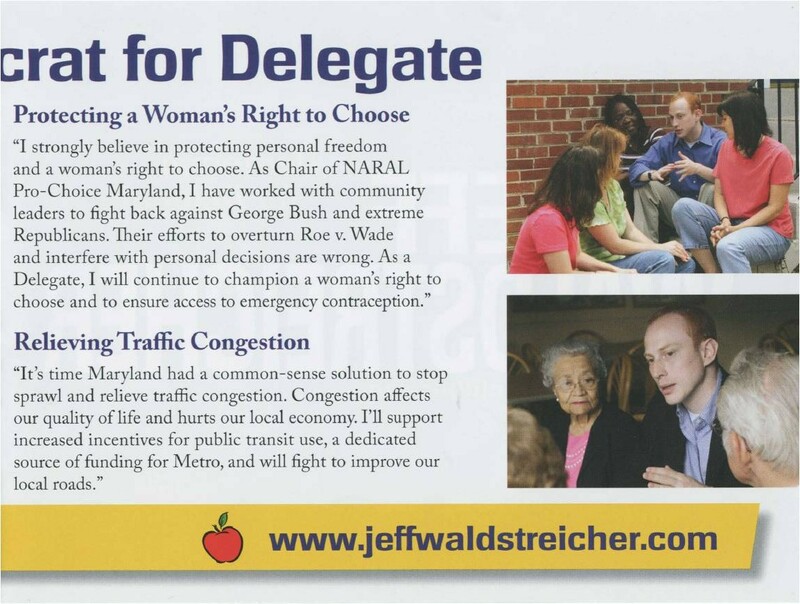 Silverman’s platform was unusually parochial for a MoCo state legislative candidate. 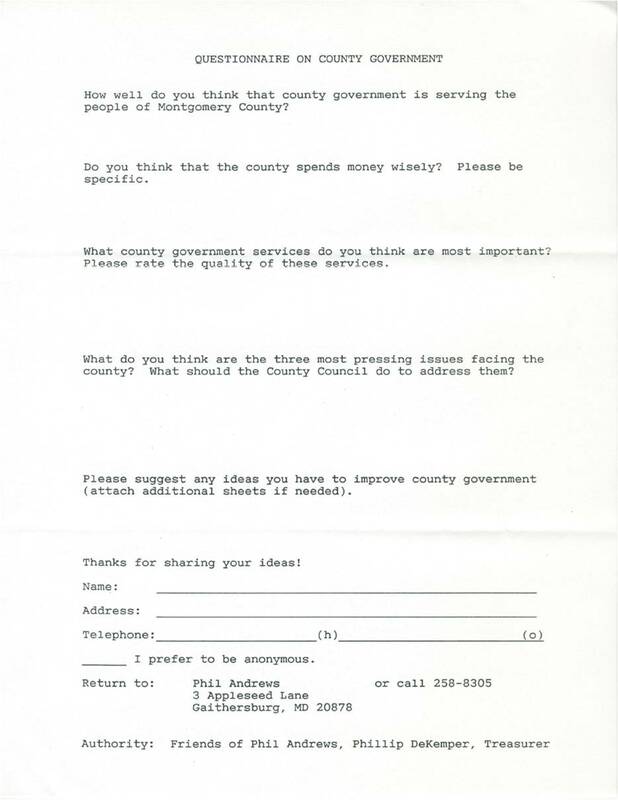 In his intro letter below, he questioned why Baltimore City and Prince George’s County were getting sports stadiums and more state aid than MoCo. This message would later work well for Rona and Ben Kramer. Silverman lost to the incumbents, but he won an at-large County Council seat four years later and would make his mark on county politics. The only other candidate since then who has lost a Delegate race and was later elected countywide is current school board member Laura Berthiaume. Council Member Duchy Trachtenberg sent out the following email to her supporters this morning. I wanted to send you a short note from the heart to thank you for your support in the campaign that has now concluded. While we ultimately fell short of our goal, the core values and principles that we share remain as strong as ever. Our most deeply held beliefs and concerns for this community precede this election and they will endure well beyond it. I can trace the arc of my commitment to social justice over many years of activism, grassroots organizing, advocacy and public service. I know this is something you and I share—our long-term, rock-solid dedication to empowering citizens and bringing about meaningful, lasting change. It has been a tremendous honor and privilege to serve you on the County Council these past four years. When the going got tough — and believe me, it often did — I was sustained and strengthened by the knowledge that people like you believed in my mission and supported my agenda. I consider myself fortunate to have represented you on the County Council, where I sought to change the conversation to be more inclusive, more fair and more representative of your concerns. Thank you again — for everything. 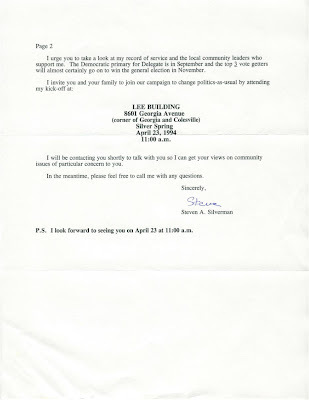 By the authority of Trachtenberg for County Council, Elaine A. Blong, Treasurer. voteduchy.org. Most state aid in Maryland is driven by wealth formulas that direct more aid per capita to “poorer” jurisdictions and less to “wealthy” jurisdictions, thereby effecting significant income transfers. But the wealth formulas used by the state have a critical flaw: they are absolutely unrelated to poverty. Almost all state aid is distributed in one of four ways. First, it can be distributed on the basis of wealth. Second, it can be distributed on the basis of “workload,” or a tangible volume measure like population, road mileage or student enrollment. Third, it can reimburse jurisdictions for all or part of actual costs they pay for specific programs. Fourth, it can match prior year disbursements. A tiny minority of programs are tied to other formulas. Wealth formulas are a dominant and growing method of determining state aid. In FY 1990, wealth formulas drove 38.5% of state aid. In FY 2010, wealth formulas drove 68.8% of state aid. Much of this increase is driven by the large increases in aid to public schools produced by the 2002 Thornton program. Maryland’s wealth formulas are typically driven by two components: assessable property tax base and net taxable income. Both components have problems. First, high-value properties are often encumbered by high mortgages. People with highly assessed properties, big mortgages and little or no equity are hardly wealthy. Second, high incomes usually reflect high costs, and those are not considered in the wealth formula at all. Both of these issues plague Montgomery County, which has high incomes and high property values but also has big mortgages, high gasoline costs and lots and lots of foreclosures. But perhaps a bigger issue is that the wealth formulas are utterly unrelated to the number of poor people living in each jurisdiction. Helping jurisdictions educate and provide services to the poor should be a central goal of any state as dedicated to income redistribution as is Maryland. Otherwise, why do it? Poverty is an especially important consideration in public school spending, which accounted for 88% of all state aid in FY 2010, because poor kids are likely to need free-and-reduced price meals as well as extra instruction. Below, we show total population and population living in poverty for sixteen Maryland jurisdictions on which the Census Bureau has data for 2008. We also show total aid payments to each of those jurisdictions. Bear in mind that over two-thirds of these payments are driven by wealth formulas. Finally, we show state aid per person living in poverty for each jurisdiction. In FY 2010, the state spent an average amount of $14,202 for every Marylander living in poverty. But that figure fluctuated wildly between the jurisdictions. Baltimore City leads the state in aid ($1.2 billion) and in poor people (119,340), but is dead last in aid per poor person ($9,704). Howard County, which has the highest median household income in Maryland, gets the most aid per poor person ($27,318). Why should the state’s richest jurisdiction get three times the aid per poor person as the state’s poorest jurisdiction? Montgomery County fares badly on this measure, having the state’s third-highest population in poverty and yet getting less than the state average ($12,397) in aid per poor person. Prince George’s County, which actually has fewer poor people than Montgomery, receives much more aid per poor person ($21,378). Given the above data, it’s difficult to conclude that the wealth formulas as currently structured by Maryland serve any progressive purpose. Relative to poverty, the state aid payments appear to be sprayed around virtually at random. If they are to be useful for any reason other than parochial politics, the wealth formulas should include measures tied to the actual numbers of poor people living in each jurisdiction. If not, they should simply be abolished. Council Member Valerie Ervin, who had no primary opponent, has sent the following email to her supporters concerning the general election. I want to express my heartfelt thanks to you, your family and your friends for supporting me in the 2010 Democratic Primary Election. I am honored to have the opportunity to serve my community as a member of the Montgomery County Council as we continue our work on important issues like education, public safety, the environment and improving the lives of working families. We have accomplished great things by working together throughout the last four years; however, there is still more work to do. In a leadership role on the County Council, I am committed to working with all of my colleagues to enhance the quality of life in Montgomery County. I am also excited that many of the candidates I endorsed early in the campaign season ran successful races. Hans Riemer and Craig Rice will be joining me on the County Council, and Roger Manno will be a new State Senator. All share my progressive values, and I look forward to working closely with each of them. While I was fortunate to run unopposed in the 2010 Primary Election, I face a Republican challenger in November. Please remember to vote for me on November 2. I need your support so we can continue the work we started four years ago. Also, please let me know if you would like a Valerie Ervin yard sign or if you would like to make a campaign contribution. Any way you can help would make a difference. Request your lawn sign and sign up to volunteer: http://valerieervin.com/volunteer/. Donate $5, $10, $25 or more online! You can contribute here: http://valerieervin.com/contribute/. Thanks so much for all you have done and thank you in advance for your support in the future. If you compare the statistics on voting in Leisure World with voting in the county and district 19, there are some interesting comparisons. According to the Montgomery County Board of Elections, about 19% of the registered voters in the county cast ballots in the September 14, 2010, primary. Using statistics from the same source, at least 33% of the registered Democrats in Leisure World cast ballots in that primary, and the number of registered voters in LW is unusually high to begin with, about 7,200 registered out of about 8,500 residents. The lineup of votes for district 19 Delegates in Leisure World was Kramer, Arora, Cullison, with 31%, 21%, and 19% of the total votes, while the lineup in district 19 as a whole was Kramer, Cullison, Arora, (reversing the LW results for the 2nd and 3rd spots) by 26%, 21%, and 20%. Ben Kramer is extremely popular in LW, and Arora and Dang were the candidates who probably had more events at LW than others. For County Council LW voted for Leventhal, Trachtenberg, Floreen, and Elrich, with Riemer in 5th place, by 17%, 17%, 16%, 15%, and 12% of the votes. The county as a whole went for Elrich, Riemer, Floreen, and Leventhal by 18%, 15%, 15%, 14%, and 13%. Riemer probably had more events at LW than other candidates for this position. Conclusions: Leisure World residents, especially registered Democrats in LW, vote in far larger numbers and percentages than elsewhere. However, the winners and losers in LW are not necessarily the same as in the whole district or county, despite the force of the large LW voting numbers --- which is still extremely significant and will continue to be so. District 16 House candidate Kyle Lierman has sent the following email thanking his supporters and congratulating the winners of his primary. Now that our campaign is over and I've had some time to reflect on the last few months, I want to take this opportunity to extend my sincere thanks to you and all the people who made this campaign possible. As most of you know by now, the final votes have been tallied and we came up about 350 votes short of winning one of the three nominations for delegate. Although I'm disappointed, I have no regrets, and am instead filled with gratitude toward the many people who supported our effort and with pride in the way we conducted our campaign. Any great effort starts with the support of one's family, and over the last four months, mine went all in for me. Thank you to my mother (and treasurer) Connie, father Terry, sister Brooke and her husband Eben, and brother Trent and his wife Holly for all of their hard work and dedication. I also want to give a special thanks to my great friend and Campaign Chair, Irene Pollin. And all of our volunteers, especially Sara Conrath, David Dimock, Sue Byrnes and Lucy Freeman. I am extraordinarily proud of the campaign that we mounted. We knocked on over 23,000 doors, made over 10,000 phone calls, sent over 4,000 postcards, and built a base of support on the idea that our constituents deserved a representative that puts their interests above any special interest. I want to congratulate Susan Lee, Bill Frick and Ariana Kelly on gaining the Democratic nominations. I also want to congratulate the other challengers, many of whom I now consider friends, for running strong, positive campaigns and for showing the wide array of talent in this district. I look forward to working with all of them - and all of you - to make sure District 16 has a strong turnout for Governor O’Malley in November. Thank you again for your hard work and dedication and for believing in me and our campaign; I am forever indebted to you for your commitment and support. The Post editorial page started going after MCEA back in February, trying its best to affect the appeal of the union's support. Well, the primary returns are in and the endorsements can be compared. So who had the better record - the Post or MCEA? The newspaper and the union disagreed on fourteen positions. Here are the results of their choices. So when the Post and MCEA went head-to-head, the union won in 11 of 14 races. Here are their records from 2006 through 2009. So during this period, when the Post and MCEA made opposing endorsements, the union won in 8 of 11 races. This means that the result of the Post's anti-MCEA campaign has been to increase the union's comparative winning percentage. I spent my summer knocking on thousands of doors across District 14, asking for votes and listening to what voters had on their minds. Here and there, voters brought up the big issues that get media coverage: marriage equality, abortion, the economy, the schools. But the overwhelming majority of people I spoke with were concerned about things happening to much closer to home. In Tanterra and Peachwood, I heard from residents who were tired of having grass growing out of their streets and of swerving to avoid massive potholes. In Spencerville, Olney, and Damascus, I heard from parents who were concerned about cuts at the libraries and the elimination of summer reading programs. In Burtonsville and Silver Spring, residents wanted to know how we were going to bring more bioscience jobs to the east county. The uniting factor in all of these issues is money. A significant part of the county’s funding comes from the state of Maryland. They help us build roads and transit, fund our schools, and support entrepreneurship and small businesses. It’s certainly not as much as we need, or deserve, but without those dollars the budget crisis affecting our county services would be much, much worse. Martin O’Malley has fought, and fought hard, to balance the state budget while preserving as much funding as possible for communities across the state. He inherited a budget in crisis, made the tough choices, and still did what was right for Montgomery County families. $2.4 billion for our public schools. Almost $50 million this year alone for Montgomery College. An enormously long list of capital project funding and grants from the Gaithersburg Library expansion to an activity center for the Jewish Foundation for Group Homes. He secured $8.5 million in local highway funds and nearly $100 million from the federal government in transportation recovery funds. By contrast, Bob Ehrlich’s four years led a massive budget deficit and exhibited an almost complete ignorance of the issues that Montgomery County cares about. If elected again, it’s virtually guaranteed that Ehrlich would slash support for our public schools and defund the transit projects we need. Four more years of Ehrlich would be an unparalleled disaster for our county. These are tough times, and this is going to be a tough election. Montgomery County needs to see clearly what’s at stake. In Martin O’Malley, we have a leader who stands up for our families and communities. In Bob Ehrlich, we didn’t. Montgomery needs O’Malley, and all of us who care about the quality of life here need to work hard to get him re-elected. With the primary election over, I would like to thank those candidates who have removed their campaign signs from highway medians and other public spaces around the county. I would also like to ask those candidates who have not yet removed their signs to please do so. In my neighborhood, the Georgia Avenue median between Forest Glen and August Drive is still littered with signs, almost unchanged from Election Day. For thousands of families, Georgia Avenue is the front door to our communities. But wherever in the county we live, I think we'd all like our neighborhoods to be kept free of litter and illegally posted signs. The primary is over. Please help us keep our neighborhoods clean by taking your signs down now. Thanks. Last night saw the county Democrats’ traditional post-primary Kiss and Make Up Party. And boy, there was a whole lot of kissing up going on! Dems gather to listen to fighting words from the Mighty Babs! The purpose of the Kiss and Make Up Party is to recover from the heated rivalry of the primaries and to unite for the general election. Food, gossip and deal-cutting are just bonuses, as are the opportunities to rub shoulders with dignitaries like the Governor. It’s easy for the primary winners to show up for such things. Successful candidates love to bask in glory and be told what wonderful races they ran, whether such races were truly wonderful or not. But the real credit belongs to those who did not win and still showed up. The natural instinct for anyone who loses an election is to curl up in the bedroom and not come out. But those who lost and still came were welcomed with extra warmth. Your author heard not a single cross word exchanged – only well wishes and relief for the end of primary season. In fact, all the candidates were repeatedly feted by the speakers whether they won or lost. Even Amy Yockus Hartman, Nancy King’s fearsome campaign manager, cheerfully welcomed your author when she could have easily welcomed yours truly with a sharp object instead. If we had known she was such a sweet thing, we would not have been so mean to her on the blog! Cheryl Kagan – this bunny just keeps on hopping! From left to right: District 16’s Craig Herskowitz, Bill Farley, Bill Frick, Scott Goldberg, Ariana Kelly, Peter Dennis, Susan Lee, Kyle Lierman and Hrant Jamgochian. District 19 House candidates Jay Hutchins and Hoan Dang. So who did not attend? More than the party would like to admit! But these people were notably absent. One wag noted of Atterbeary, “She wants to preserve her perfect record of never coming to a party event.” Meeoow! Everybody shut up! Pete Franchot is talking, dammit! Aside from all the food, hand-shaking, gabbing and wine-guzzling, there was one serious undertone to the gathering. MoCo’s abysmal primary turnout is clearly worrisome to the state Democrats. They are nervous about what that means for the general election between Governor O’Malley and his predecessor, former Governor Bob Ehrlich. It’s unlikely that any Kiss and Make Up party can fix that issue. But the Democrats had better find some way to deal with it, because otherwise, the next Kiss and Make Up event will include the GOP. Update: We hear that District 14 House candidate Gerald Roper and District 16 House candidate Charlie Chester showed up too. Council Member George Leventhal, who has won the Democratic primary for a third term, has sent the following email to his supporters. Leventhal is a canny political observer, having chaired the party's central committee for five years prior to his first election, and we agree with his remarks on the county's low turnout. Thank you so much for your support! I am honored to have won the Democratic Party's nomination for the third time to serve as an At-Large member of the Montgomery County Council. I will never forget the hundreds of friends who took the time to help my campaign, give me encouragement and make contributions. Working together, we won! We should all be proud of what we accomplished. My congratulations to incumbents Marc Elrich and Nancy Floreen and newcomer Hans Riemer, who were also nominated in the Primary Election. The four of us will be running together as a Democratic slate. If you would like to keep your "Re-Elect Leventhal" signs up in your yards until the November 2 General Election, please feel free to do so. We do have Republican opposition in the General Election but historically, the Democratic nominees for Montgomery County Council, At-Large have not encountered difficulty winning in November. I encourage you to join me now in turning our focus to the re-election of Governor Martin O'Malley, who shares our priorities of job creation, education and a healthy environment. The most recent estimate shows that only 19.44% of eligible voters participated in the September 14 Primary Election in Montgomery County. If Montgomery County turnout remains low in the November 2 General Election, Governor O'Malley will have difficulty getting re-elected. I do not want to see Maryland go backwards. I would be very interested in your thoughts on how we can increase voter turnout in the fall. Thank you again for all the support you have shown me. I look forward to serving you for another four years on the County Council. Please let me know if there is any way I can be of assistance to you. Council Member Duchy Trachtenberg is claiming to be a victim of the unions, blaming them for her defeat in the primary. But for all her many enemies, one person in particular did more to prevent her reelection than anyone else. It was May 9, 2008. The County Council’s Management and Fiscal Policy Committee, then comprised of Chairwoman Duchy Trachtenberg and Council Members Valerie Ervin and Phil Andrews, met to discuss breaking the county employees’ contracts. This was a prelude to the harder county budget battles that would come over the next two years, when the county’s deficits would hit the upper nine digits. Trachtenberg and Andrews wanted to cut two points from the employees’ cost of living adjustments (COLAs). Ervin disagreed. Hundreds of MCGEO members swarmed the room to watch, along with your author. Ervin was in her element, reminding the crowd that she had been a member of their parent union and saw no need to cut their increases. Seeing Ervin with a group of union members is like seeing Tom Brady with a group of Boston schoolgirls, and the members cheered loudly. Andrews, with his customary smile and respectful tone of voice, explained that the county had budget problems and it was only fair for employees to contribute to the solution. After all, the County Executive had proposed breaking the property tax charter limit as part of his proposed budget. The MCGEO members booed, but they expected this from Andrews. He had been elected with labor support in 1998 and 2002 but had since strayed. More importantly, Andrews was civil, direct and non-confrontational. He was simply speaking his mind. Then it was Duchy Trachtenberg’s turn. She was clearly flinching from the rock-star ovation given to Ervin and the flyers distributed by the union (which she later used in her 2010 campaign literature). Her voice shaking with cold melodrama, she lectured the crowd on her often-told story about her son’s schizophrenia and contended that the allegedly high labor costs of Maryland’s public employees had forced her to send him to New York for treatment. As a result, she said that she was sticking up for the truly needy – the people who were not union members. The crowd took this as a horrible insult. Trachtenberg was blaming their greed for her inability to find in-state mental health care for her son. The reaction was one of deafening outrage. A man sitting directly to your author’s left rose to his feet, face red with fury. “I’m a single Dad and I’ve got five kids!” he yelled. “What about my kids?” Two women approached the dais from the right side, fists clenched, signs aloft and voices raised in anger. The whole room shook with pandemonium for several minutes as the county employees could not contain themselves. Trachtenberg could have used Phil Andrews’s argument, which was based mostly on numbers and delivered without rancor. But she had to make it personal. This was Duchy Trachtenberg’s governing style: alienate people, blame them for it, and then claim to be the victim. This pattern played out over and over again in her relationships with colleagues. Trachtenberg constantly feuded with them. Despite styling herself a women’s advocate, she tried to kill a 2008 domestic worker protection bill authored by George Leventhal and Marc Elrich because they did not consult with her prior to introducing it. Months later, when then-Council President Mike Knapp questioned a funding amount to be set aside for pensions, Trachtenberg complained to the Gazette that he was trying to “marginalize” her. Last year, Trachtenberg harshly condemned Nancy Floreen’s ascendancy to the Council Presidency, saying it was “political punishment of political opponents.” Of course, Trachtenberg’s real complaint was that a succession plan delivering her the Council Presidency had been disrupted by Floreen’s successful bid for the office. Finally, Trachtenberg even went after her chief benefactor, County Executive Ike Leggett, by comparing his administration to the KGB. It seemed that no one in Rockville was spared from Trachtenberg’s lash. Additionally, Trachtenberg’s hypocrisy on a broad range of issues made it impossible for many people inside and outside government to tolerate her. Trachtenberg was hypocritical about ethics, justifiably raising questions about lobbyist-funded trips to Israel but then threatening to sue Maryland NOW to prevent them from discussing her handling of money as their Treasurer. Trachtenberg was hypocritical about public spending, telling county employees to tighten their belts right after missing three weeks of work while on a publicly-funded junket to Massachusetts. Trachtenberg was hypocritical about her relationships with unions, taking their money and support in 2006, then publicly disavowing them, then trying to get their support again through Progressive Maryland. Trachtenberg was hypocritical about campaign financing, telling Progressive Neighbors that she rejected development industry contributions after taking a $1,000 check from a Rockville commercial real estate construction company. And Trachtenberg was hypocritical about women’s issues, proclaiming herself their champion while refusing to support qualified female candidates for office. This kind of behavior fueled a seething contempt for Trachtenberg that permeated the council building. On April 21, 2009, Trachtenberg became so annoyed with Council Member George Leventhal that she walked off the council dais during a vote – something that no one could recall having seen before. On April 23, we posted that story at 7 AM. Trachtenberg came into work, saw the post and threw an awful tantrum. We began receiving a steady stream of phone calls and emails describing her progress through the sixth floor as she wreaked havoc, slamming doors and “yelling at the top of her lungs.” We had heard of Trachtenberg’s temper before, but the fact that so many people were eager to feed us the details of her fury was remarkable. How profoundly had she offended them that they were so willing to tell us such things? Trachtenberg lost her reelection bid for three reasons. First, she alienated most of her supporters in 2006 – and not just in the unions – through her conduct as a Council Member. Second, she was unable to build a new base because of her ineffective staffing, failure to build relationships and non-existent constituent service. And third, she made very bad resource decisions during the campaign. We described those decisions in a post written the day before the election. Our informants are baffled by Duchy Trachtenberg’s spending. She started the year with $289,198 – far more than any other candidate and mostly raised out-of-state in four-digit checks. Since then, she has spent more on tracking polls and consulting ($35,000) than she has on printing, direct mail and postage ($33,817). Contrast her printing, mailing and postage total to those of Senator Mike Lenett ($129,378) and Delegate Saqib Ali ($104,876), each of whom is running in a district that is one-eighth of the county. 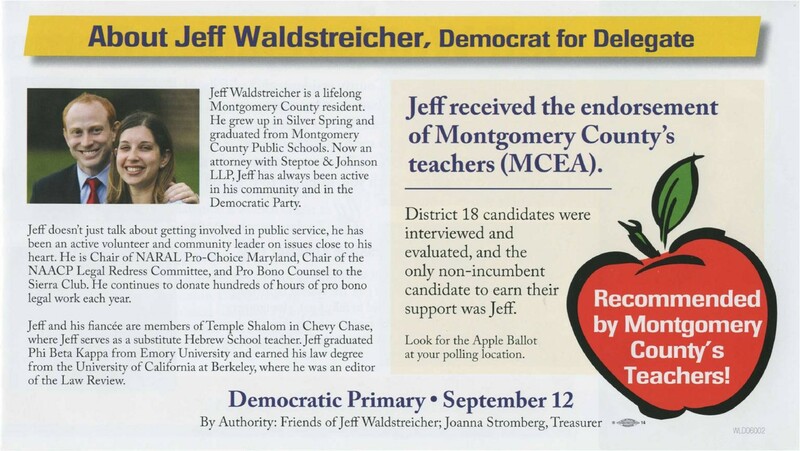 Trachtenberg’s ads in Bethesda Magazine, Washington Jewish Week, Leisure World News and Takoma Park Voice – purchased for a combined cost of just $7,230 – have been no substitute for the robust mail program she could have afforded. She has done just one mass mailing and was, incredibly, beaten to the mailbox by Becky Wagner. As of August 29, Trachtenberg was sitting on $209,629 with just sixteen days left to spend it. Television could consume that amount of money rapidly, but we have seen no sign of any such ads. And it’s getting late – VERY late. Some sources are speculating that she is so sure of victory that she is saving the money for a County Executive run. Unless she has a grand strategy that has not shown up in her finance reports, she could very well be the richest loser in MoCo history. Puzzled by this behavior, we consulted sources who had knowledge of Trachtenberg’s campaign strategy. One informant said she deliberately hired incompetent campaign staff because she did not want anyone to question her decision-making. Another speculated that Trachtenberg was convinced by her polling that she would win and was banking her money for a County Executive race. (Indeed, Trachtenberg told several spies she was interested in running for Executive in 2014.) Trachtenberg’s addiction to polling resembled the behavior of a nervous aircraft passenger flying through turbulence and constantly checking her watch. Regardless of the reasons, Trachtenberg’s ineptitude became clear in the final days of the election. She only sent out two mass mailers – far behind the mail totals of lesser-funded candidates – and seemed to rely primarily on illegal signs. Trachtenberg overestimated her support, coasted on name recognition and lost by a significant margin – all problems of her own making. The Post wrote that the unions took out Trachtenberg. Despite their chest-beating, that is just not true. Labor promoted their endorsees, but that was about the sum total of their participation in the at-large primary. No one sent out a single piece of negative mail against Trachtenberg – not the unions, not the other candidates, not anyone. Compare that to what SEIU did to Prince George’s County Senators Nathaniel Exum and David Harrington. Only two MoCo candidates saw negative mailers from labor – District 14 Senator Rona Kramer and (surprisingly) District 39 Senate challenger Saqib Ali. 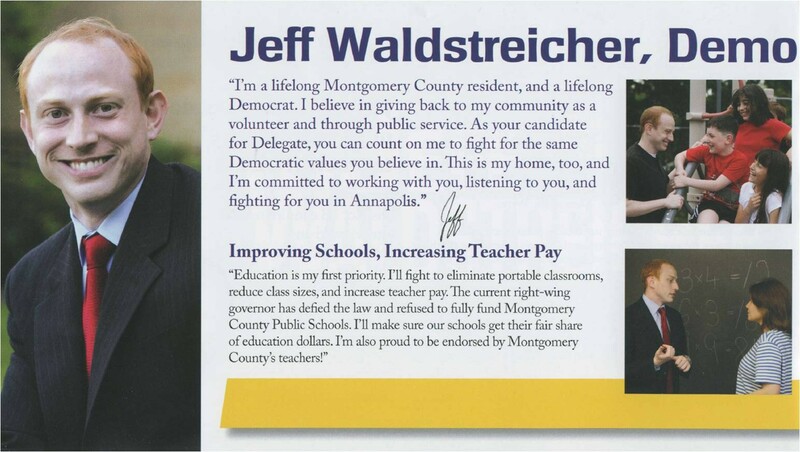 In the meanest MoCo primary of all time, Trachtenberg was largely spared. Even the complaint by the Fraternal Order of Police about Trachtenberg’s mishandling money at Maryland NOW could not have affected the election outcome because it came too late and never made it into physical print before the primary. The Post inaccurately stated that Trachtenberg was Treasurer of Maryland NOW four years ago. In fact, she stepped down from that position in late 2008 - during her term in public office. That error was repeated in the Post’s over-the-top editorial, an example of sloppiness feeding a pre-decided narrative in both the editorial office and the newsroom. The police and any other citizens have an absolute right to be concerned over the conduct of elected officials while they are in office. And the facts that Trachtenberg threatened to sue NOW if anyone discussed her tenure there with the media and that Maryland NOW had to rewrite their bylaws to make the Treasurer position more accountable after she left create reasonable grounds for raising the issue. The bottom line is that given the record above, Trachtenberg cannot claim to be a victim if there is no victimizer. 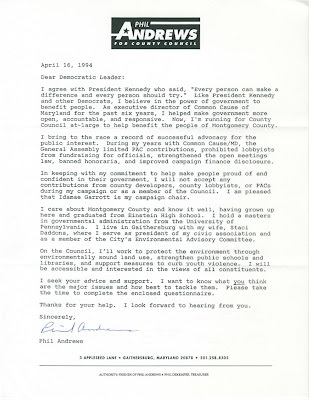 If Duchy Trachtenberg had Phil Andrews’s even temperament, Roger Berliner’s pragmatism and Marc Elrich’s dogged dedication to relationship building, she could have taken the same policy positions and not attracted so many enemies. And if she had used her campaign war chest to hire people with Hans Riemer’s campaign skills, she could have won. But instead, she is a case study for how not to serve on the council and how not to run for reelection. And that is no one’s fault but her own. District 17 Senate challenger Cheryl Kagan has sent the following email to her supporters after losing a very close race to Senator Jennie Forehand. Now that the Primary Election is behind us, I want to thank you for your support throughout this campaign and for your kind words in the past few days. Both have meant the world to me. I congratulate Jennie Forehand for her 32 years of service to our district and her victory on Tuesday. I wish her well in these next four years. Surely, they will be challenging ones for the State… and therefore for Montgomery County’s fiscal stake in it. I continue to be proud to be a Democrat… and a democrat. I am proud of the progressive ideals of our Democratic Party. We stand for justice, equality, compassion, economic opportunity, common sense fiscal solutions, and a commitment to protecting our environment and the people who live in it. I am also proud that we live in a democracy, where open debate, dissent, and dynamic elections are expected and encouraged. Thanks to over 1,000 donors and volunteers, we communicated our message to every corner of District 17. The voters in Gaithersburg, Rockville, and Garrett Park were warm and welcoming when I knocked on their doors. They shared their concerns and their hopes for the future. I met so many active, engaged citizens and was always inspired by their stories. Election Day fell this year in the midst of the Jewish High Holy Days, which are a time to look back to evaluate our behavior and to look forward with hope. This confluence of events was both a challenge and an opportunity. As a candidate it is hard to put aside worldly considerations four days from Election Day. But it was also fitting, because in elections we review history and chart future directions. My sincerest thanks go out to everyone who contributed their time, money and ideas to our effort. We pulled together a dynamic and diverse community that believed that tough times call for tough choices, hard work, and the effective advocacy needed to bring about change. I hope that each of you will continue to stay engaged in the political process. Our democracy depends on the involvement of talented, thoughtful and caring people like you. And I hope that you will see the extraordinary challenges we face as opportunities for the creative solutions that can result from a fresh look at what is possible and a renewed energy to bring it to fruition. I will continue to be active in the Party and in our community. Right now, however, I am looking forward to taking some time to relax with my wonderful husband and address a lengthy to-do list that has grown during the months I was on the campaign trail. I am humbled by the kindness and generosity I have received from so many. Even though we didn’t achieve the result we were hoping for, this is truly one of those efforts in which the journey is an end in itself. Political campaigns are busy, noisy, exhausting and sometimes bewildering, but in a certain, special way, they are quietly enlightening. Even if you’ve lived there for years, you get to know your district better than you ever did before. Though you’ve studied them in theory, you understand the issues better and in a deeper, more concrete way. And you get to know the people you’re working with-- often during 14 hour days, often in difficult circumstances-- in a way that’s revealing and endearing and fascinating. For all of that, I am grateful.